Here’s a dish perfect for this time of year, but still doesn’t feel like stodge-o-rama thanks to the amount of veg involved. The star ingredient is the sausage, a meaty banger from Simply Sausages. I used their No.1 Recipe Smithfield Original, a relatively unadorned sausage which gives the pork plenty of space for flavour. Mrs. Spud and I thought it was quite simply the best sausage we’ve ever eaten. The technique is inspired by a similar recipe from Jamie’s 15-Minute Meals . Essentially process a whole bunch of root veg and fry with bacon and tomatoes as a sauce base! It’s a recipe with lots of room to maneuver, by just swapping the veg in and out you get a different taste each time. And even if you take it easy it should be 20 mins work, tops. Thanks to Amanda from ZPR for the sausages! Preheat the grill on medium, get a large pan of salted water on to boil and put a large frying pan over a medium-high heat. Get your food processor ready too. Pop the sausages under the grill and cook for 10 – 15 minutes, turning regularly. In the food processor whizz up the bacon and add to the pan. While that fries add the carrots, celery, sage and onion to the food processor, whizz that up and add that to the pan. Finally blitz the squash and add that to the same pan. Add some salt and pepper. Toss the veg regularly. While that cooks in the pan, add the pasta to the water and cook according to the packet instructions. Crush the garlic into the veg pan, and after a minute or so more’s cooking, add the tin of tomatoes. Half fill the tin with water and add to the pan along with the stock pot. Stir well. If it’s looking a little dry add some of the pasta cooking water to loosen it. 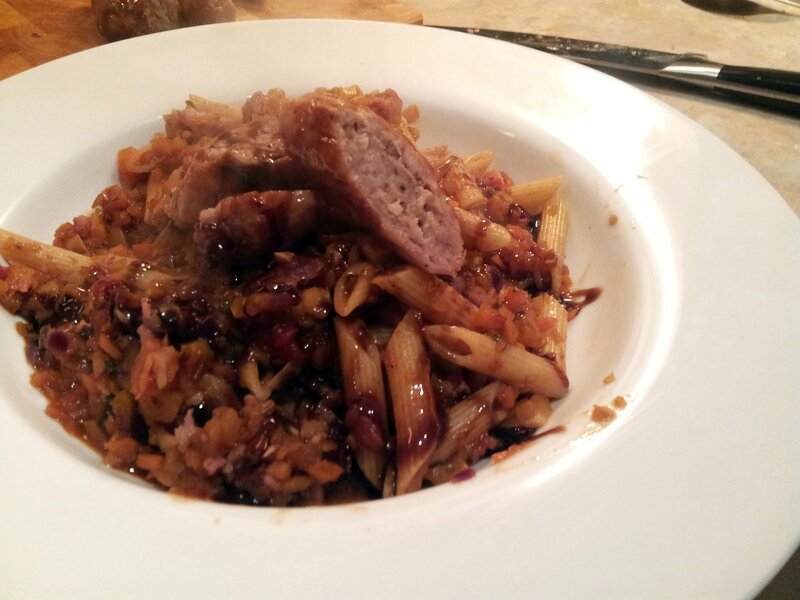 When the sausages are cooked cut into slices, drain the pasta and toss both through the veg. Check for seasoning and serve, dressing with balsamic vinegar.